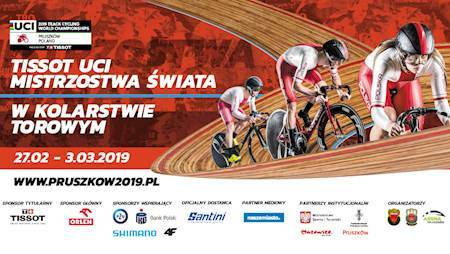 2019 UCI Track Cycling World Championships presented by TISSOT: 27.02-3.03.2019, Arena Pruszków! Also available: VIP tickets with catering and the best view of the track and FAN Tickets - collector tickets available online only via post or courier delivery! - afternoon session 1 p.m.
- evening sessions (finals) 5.30 p.m.
- afternoon session 2.30 p.m.
- evening sessions (finals) 6.30 p.m.
- afternoon session 3 p.m.
- afternoon session at 12 a.m.
- evening sessions (finals) 5 p.m.
- evening sessions (finals) 2 p.m.
*Competition schedule is subject to change without notice! The World Track Cycling Championship is one of the oldest championship events in the world. It has its origins in the amateur cycling competition organized in 1893 in Chicago by the ICA (International Cycling Association). Since 1895 in Cologne, Germany, there have been separate races for amateurs and professionals. It was not until 1993 that it was decided to merge the two races and since then the amateur riders and professional riders have been taking part in the "Open" championship. The championships are open to cyclists chosen by their national cycling associations and appear in the colours of their own country. The winners receive a rainbow t-shirt in addition to the gold medal, while the second and third places are awarded silver and bronze medals respectively. Former world champions have the right to wear rainbow colours on the sleeves of their T-shirts. The most tracked nation are the French, who so far have won as many as 141 gold medals (and 375 medals in total). Behind them are the British with 104 gold medals (246 of them all) and the Dutch (88 championships and 263 medals in total), who hosted the world championships in Apeldoorn in 2018. Poles hosting this event the second time in the history of the world championship, so far have collected 23 medals - including 9 gold medals. During the last World Championships the medal classification was won by the Dutch, who won 12 discs, including 5 gold. Szymon Sajnok, who rides in the CCC Sprandi Polkowice colours on a daily basis was the World Champion in Omnium. Excellent performances of Polish riders in recent years guarantee not only huge emotions, but also allow us to believe that the World Championships in Pruszków will be the best for the white-and-red in the history of their performances in the most important championships.